KILLINGTON — This year, 14 Killington Aquatic Club swimmers have made qualifying times to compete at Regionals Feb. 13 and 14. This is triple the number from last season, Head Coach Kim Peters said. The swimmers qualifying for Regionals include: Ethan Courcelle, Kyle Harned, Maria Hogencamp, Pema Kerins, Sophia Nisimblat, Justine Peters, Mattie Peters, Bailey Peters, Heidi Alf, Allison Reed, Pippa Scott, Marco Svoren, Nova Wang, and Logan Knox. It’s been an exciting season for KAC, expecially these last few weeks with KAC swimmers posting impressive results. On Jan. 9 and 10 four of the KAC swimmers, Bailey Peters, Justine Peters, Mattie Peters and Heidi Alf, traveled to Boston University for a preliminary/final swim meet. The four swimmers made their mark, qualifying in events to compete at finals each night. 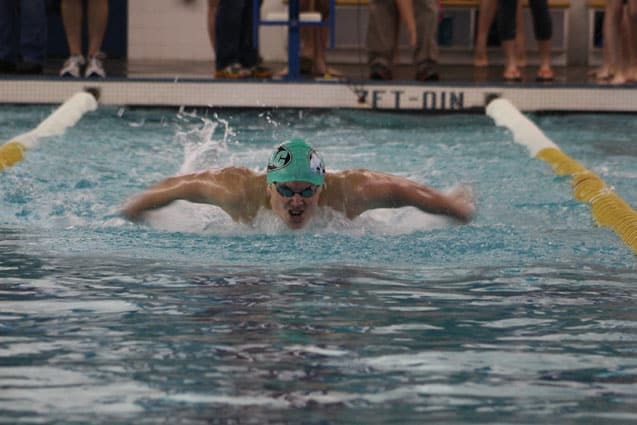 Bailey Peters, a junior at Rutland High School, made finals for all six of his events and qualified for his age group meet, which will be held in March at Boston University. The following weekend the KAC team had 22 swimmers compete at Norwich University where three KAC swimmers were recognized for having top times in five events: Bailey Peters finished first place in the 15-18 age group, finishing in second place was his teammate, Nova Wang, also a junior at RHS. Ethan Courcelle took third place in the 11-12 boys age group. “I could not be more happy and proud of how the season has gone, more participation at swim meets, building a competitive team, and reaching goals! Swimming is such a great individual sport for goal setting, but also great way to meet new friends from all schools!” said Head Coach Kim Peters. The Killington Aquatic Club is a USA competitive swim team, which practices at Pico Sports Center. This year,the team consists of 15 competitive swimmers, which is 10 more than last year, Peters noted. The team practices 4-6 times a week after school. The program also has a cross-training team, which has also tripled in numbers from last winter. The competitive team and cross-training team have athletes from Rutland Town School, Barstow School, Rutland Intermediate School, Rutland High School, Christ the King, and Killington Elementary School. The swimmers travel to compete, since Pico Sports Center is not equipped to host a meet. For more information visit www.killingtonaquaticclub.com.